Edward Redlich, CCIM, Vice-President, from the Industrial Division of ComReal Miami, Inc., announces the successful sales and purchase of the 2.95 acres site at the Southwest corner of 140th Terrace & 119th Avenue in South Dade. The sale price was $2,275,000 or about $18 per square foot. ComReal represented the Seller, Precision Response Corporation (PRC). The Buyer is Deerwood Financial Center and its principal is Mr. Brett Houston. DFC was represented by Mr. David Colonna of Colonna Properties. PRC had previously used the vacant land site as its parking lot for 300 employees that once occupied the two adjacent office buildings that were used for their call center operations. In the Fall of 2007, PRC vacated all three properties in Deerwood Park and ComReal was retained to represent all three owners in their subsequent dispositions. In November, the 11,000 sq. ft. Deerwood Office Space at 11400 SW 119th Avenue was leased to Enterprise Rent-A-Car for their South Florida Regional Headquarters. Then in December, the 22,000 sq. ft. Deerwood Center at 11975 SW 140th Terrace was sold to Sunrise Home Health Care Company for $3,500,000. ComReal represented the Seller, Burger King Corporation. The facility had been originally constructed and operated by Burger King Headquarter’s backup data center. In November, Mr. Houston had placed the three acres under contract, when shortly thereafter in January, PRC announced that it had filed for Chapter 11 Bankruptcy. ComReal calmly assisted both parties and the bankruptcy court to evaluate the property’s value and market conditions which lead to the court’s final approval of the sale. ComReal’s marketing efforts for all three properties were both comprehensive and methodical. The properties were collectively advertised via the website: www.deerwoodparkproperties.com. 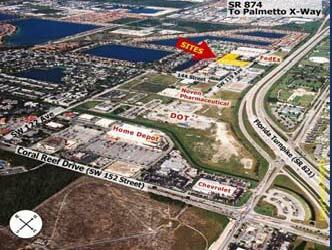 Deerwood Financial Centre plans a 50,000 sq. ft., two story office building designed to withstand a Category 5 hurricane with full back-up power capabilities. The building is designed to appeal to financial institutions and others requiring secure premises from which to provide operations center and data processing functions. The site has access to a fiber optic “pipe” and to Florida’s Turnpike Extension, the Palmetto Expressway and State Road 878- Snapper Creek Expressway, making it particularly suitable for operations center and data processing functions. For more information on Ed Redlich please call 786-433-2379.